Board Games” was the theme of this year’s Middlemarch Ball. Multiple Miss Scarlets and aged bingo players were among those spotted on the dance floor. Jeans M. Santana, a junior and pre-med student from New York City, was named winner of the 17th annual senior-year Romero Scholarship, awarded to a student who offers significant service to the Hispanic community. Gerrel Olivier, a junior from Randolph, Massachusetts, who intends a career in finance, received the Martin Luther King, Jr., Scholarship for 2009–10. 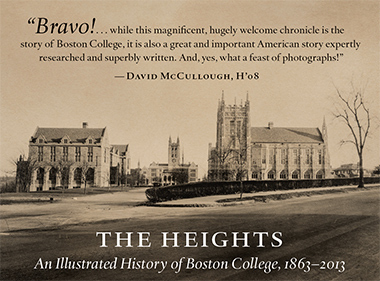 The April Fools’ issue of the Heights announced “Catholic universities ban all speakers who ever sinned” and reported on a bankrupt CSOM’s quest for federal bailout funds, with dean Andy Boynton saying, “Our biggest investment is in our students and that turned out to be a huge mistake.” The real version of the Heights dropped its weekly arts tabloid, The Scene, citing budget pressures, and reaped the anger of readers when it temporarily reduced the size of the crossword and sudoku puzzles. A campus conservation program resulted in a 4 percent reduction in energy costs between January and mid-March compared with the previous year. Residents of Keyes Hall and 90 More were treated to a barbecue after turning in campus-high reductions of 8.6 and 9.7 percent, respectively. The Office of Public Affairs launched a Twitter service for those who can’t get their Boston College news soon enough. Matthew Hayes was named best turf manager in the New England Turfgrass Conference’s annual recognition of the best-maintained athletics fields in the region; also in the region, Professor Sol Friedberg was named the top university teacher by the Northeast section of the Mathematical Association of America. Syllabi for fall courses were for the first time posted online for student review prior to the March registration period. A titanium structure developed by assistant professor of chemistry Dunwei Wang and his research group was found to improve the power-transferring efficiency of nano-panels by 33 percent, with potential applications in solar energy technology. Boston College received a series of telephoned bomb threats one night in February, each a hoax and each—BC police realized—leading them to a location visible on one of the University’s webcams. The webcams were turned off. The calls ceased. Similar threats were made at other universities. A person with no relationship to Boston College has been charged. The School of Theology and Ministry reported an increase of 50 percent in applications to its programs, from 192 to 289. Admissions director Sean Porter said that some laid-off professionals were seizing “an opportunity to fulfill a sense of calling.” Faculty James Russell and Lisa Feldman Barrett of psychology were named the inaugural editors of Emotion Review, a journal that treats the science of emotion studies. The number of student minors in environmental studies increased from 17 in 2003 to 44 this year. “Tattoo culture on BC campus nonexistent,” declared a comforting Heights headline. Crucifixes and medallions were hung on walls in 50 classrooms, completing an eight-year project that placed Christian artwork in all 121 undergraduate lecture halls. Several faculty voiced their unhappiness (and several their applause), while the Heights used its January 26 “Thumbs Up” editorial column to praise the “gift from the Jesuit Community,” along with Reggie Jackson (the expressive freshman basketball player) and the Admitted Eagles weekend program. Last year’s harvest of 440,000 hours of student and faculty service placed Boston College on a federal honor roll of universities devoted to community assistance. The Boston Redevelopment Authority approved the University’s 10-year master plan minus a 150-bed dormitory on the Brighton Campus. The plan moves to the city’s zoning board this spring and then to the mayor for final approval. Some 5,000 tons of snow were removed from the campus this winter, and the synchronized skating team won its division championship. Faculty member Udayan Mohanty received a Guggenheim fellowship for his “theoretical studies of rare chemical reactions”—the only chemist to be honored by the foundation this year; and theologian David Hollenbach, SJ, was awarded the University of Dayton’s 2008 Marianist Award for his “major contribution to the intellectual life.” Former Weatherman and current University of Illinois, Chicago, education professor Bill Ayers was invited to campus by two student groups that rescinded their invitations at the direction of the Office of Student Affairs, which cited concern that threatened attempts to disrupt Ayers’s visit might put students at risk. Students and administrators have begun work on a policy that will govern preparation for speakers who are likely to require special security efforts; and a “Support Academic Freedom at BC” Facebook page sprang up and hosted a civil, generally cogent, and (not coincidentally) signed discussion of the issues. Boston College launched Commonground, an interfaith weekend retreat for students. The Fulton Debate Society presented “Fleeting Expletives: A debate about George Carlin’s ‘Seven words you can never say on television. '” “Dear users Boston College webmail, This message is from the Boston College group?” wretchedly began a phishing e-mail widely distributed across the campus and requesting e-mail passwords. Technology security tracked down and rescued four individuals who had generously honored the request.